How to deploy on GitHub Pages? 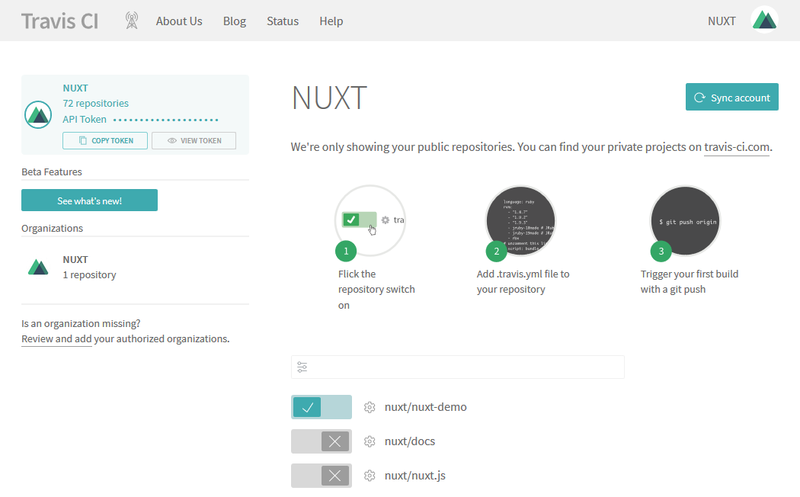 Nuxt.js gives you the possibility to host your web application on any static hosting like GitHub Pages for example. Info: If you use a custom domain for your GitHub Pages and put CNAME file, it is recommended that CNAME file is put in the static directory. More documentation about it. If you are creating GitHub Pages for one specific repository, and you don't have any custom domain, the URL of the page will be in this format: http://<username>.github.io/<repository-name>. If you deployed dist folder without adding router base, when you visit the deployed site you will find that the site is not working due to missing assets. This is because we assume that the website root will be /, but in this case it is /<repository-name>. This way, all generated path asset will be prefixed with /<repository-name>/, and the next time you deploy the code to repository GitHub Pages, the site should be working properly. "generate:gh-pages": "cross-env DEPLOY_ENV=GH_PAGES nuxt generate"
Add a deploy command to your package.json with the branch as gh-pages for project repository OR master for user or organization site. "deploy": "push-dir --dir=dist --branch=gh-pages --cleanup"
You can take deployment one step further and rather than having to manually compile and deploy the files from your local install, you can make use of a build server to monitor your GitHub repository for new commits and then checkout, compile and deploy everything for you automatically. Before you configure the build server, you'll first need to generate a GitHub personal access token in order to grant the build server permission to perform tasks on your behalf. Once you have created your token, keep a copy of it safe ready to use a little later on. To deploy with Travis CI, a free for open source projects build server, sign in via your GitHub account, granting Travis access to view your repositories, and then enable the build server for your repository by toggling the switch next to your repositories name in the list displayed. Next, click the cog icon beside your repository name to configure the general settings of the build sever and enable the 'Build only if .travis.yml is present' feature by toggling the switch. On the same screen, scroll down to the Environment Variables section and create a new variables named GITHUB_ACCESS_TOKEN and in the value field paste a copy of the GitHub personal access token your created earlier and click the 'Add' button. 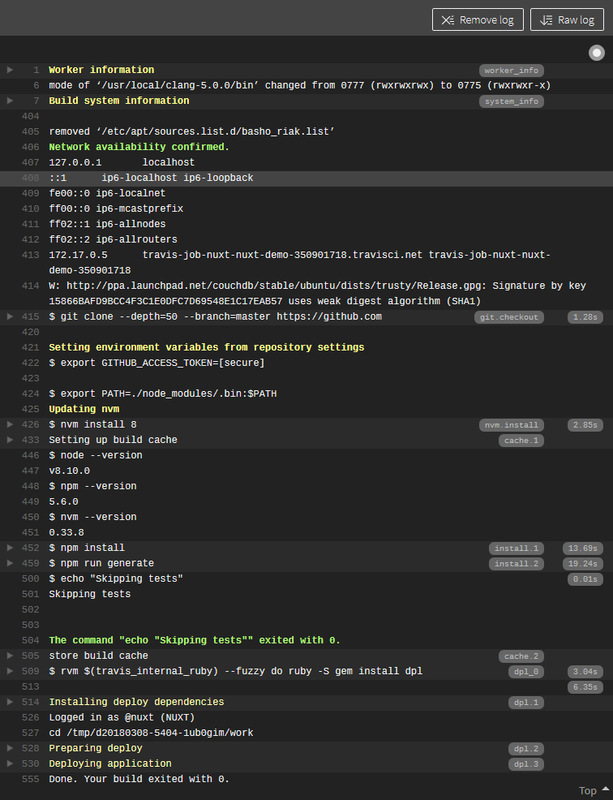 git commit -m "Adding travis deploy configuration"
and on completion, you'll see your GitHub pages site automatically updated. To deploy via Appveyor, another free for open source projects build server, sign up for a new account choosing the GitHub authentication option to sign in using your GitHub account. Once signed in, click the 'New project' link and then click the 'Add' button beside your repository name in the list displayed to enable the build server on your repository. - ps: Add-Content "$env:USERPROFILE\.git-credentials" "https://$($env:github_access_token):x-oauth-basic@github.com`n"
Before you commit this file however, you'll need to change the ENCRYPTED_GITHUB_ACCESS_TOKEN and ENCRYPTED_GITHUB_EMAIL variables with your GitHub personal access token from earlier and your GitHub email address, encrypted using the Appveyor encryption tool. 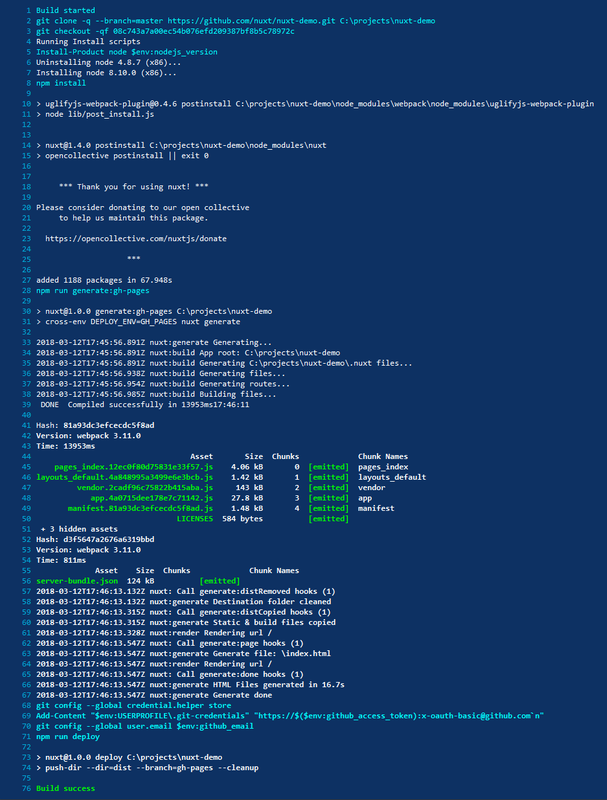 git commit -m "Adding appveyor deploy configuration"